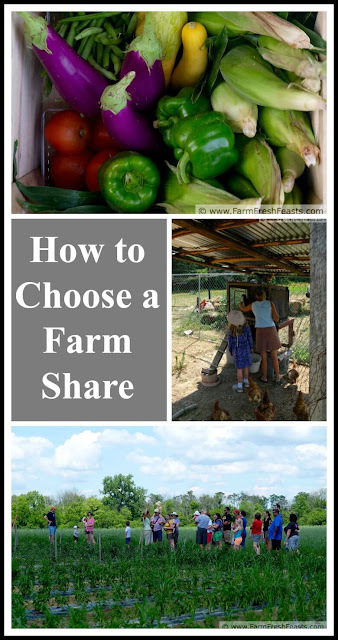 Factors to consider when choosing a Community Supported Agriculture (CSA) farm share. Welcome to Part Three of my series on How to Eat Local This Year. I'm trying to cover all the aspects I've learned over more than a decade of eating locally-sourced produce, so I've addressed different questions in each post of the series. In the first part, How to Eat Local, I cover the WHY question. To me, local produce just tastes better--and supporting local businesses supports your local economy. 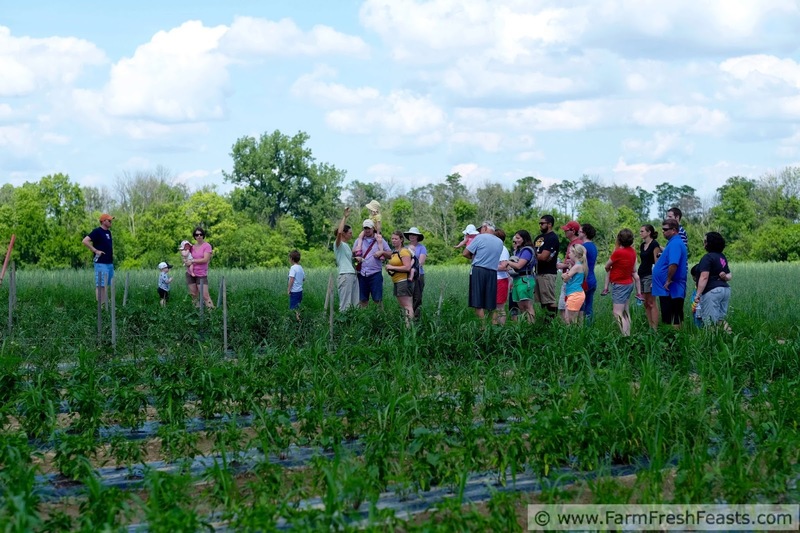 In the second part, Where to Find The Best Local Foods, I cover the WHERE--looking at farmers markets, on farm markets, grocery stores and Community Supported or Community Shared Agriculture (CSA) farm shares. Today I'm diving a little deeper into the HOW, to share the thought process behind choosing the CSA that's the best fit for you. 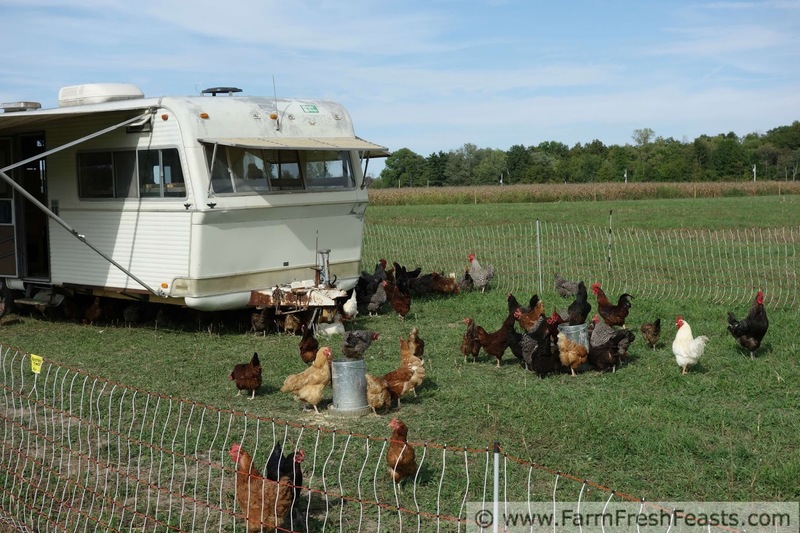 The chicken RV at Keener Family Farm. How do you find what CSAs are in your area? There are several websites that offer a CSA search function, each with slightly different populations, so you're sure to find something from one of these. My favorite is through the website Local Harvest. The USDA's Agriculture Marketing Service operates the National Farmer's Market Directory. The EatWell Guide offers a listing of markets and CSA farms as well as farm to table restaurants. My favorite site for finding pick your own farms, PickYourOwn.org, operates a sister site called LocalFarmMarkets.org. Simply enter your zip code or postal code and search for the closest CSA. The most common form of CSA is a produce CSA--mostly vegetables, some fruits. There's also meat CSAs, prepared dinners CSAs, bread CSAs, and even beer CSAs! Here in the US we are lucky to have a wide array of CSA farms in many urban, suburban, and rural areas. 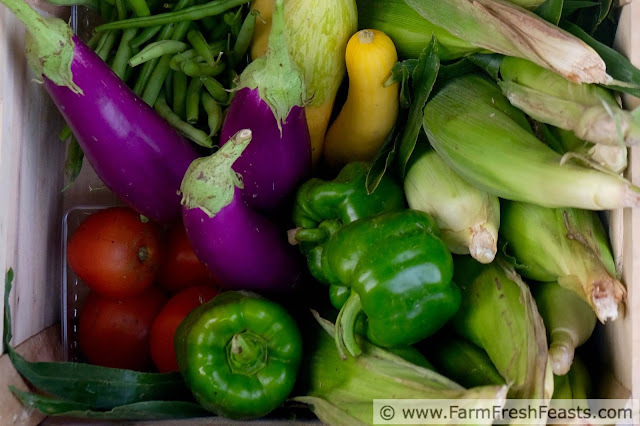 With multiple farms to choose from, how do you pick the one that's right for you? Since we've now made this choice 4 times in 2 states in the past 12 years, I figured I'd write a bit abut the primary factors that went into the decision. The biggest factor is convenience followed by the farming method, and finally the CSA model. 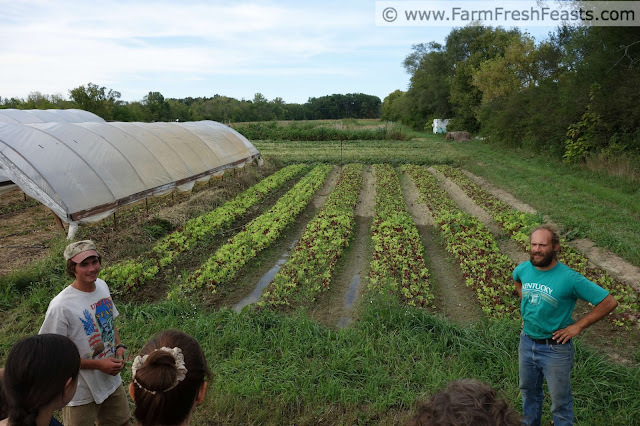 Emily Jackle of Mile Creek Farm leading a field tour. This is the most important one for me. In my opinion, if you don't need to go out of your way to obtain your produce, you are more likely to stick with a farm share. Many farmers choose to distribute their CSA produce during weekday afternoons/evenings. If that's a busy time for you (work, kids activities, school) look for a CSA that offers a delivery option. There will be an additional charge but your time saved is worth it. Farmers now distribute at workplaces as well as residential areas. If there are few options near your home, widen your circle and see if the office complex you frequent has a pickup site. In my experience, a typical CSA season is 18 to 20 weeks long. That's a lot of trips to go pick up your vegetables if you don't opt to have them delivered. Can you make the time every week? I once swooned over the offerings of an amazing-sounding CSA. There were lots of pick-your-own fruit and herb add-ons available, a playground for the kids while visiting the farm . . . but it was an hour away without traffic. No way I'd willingly join the rush hour jam just to get a box of vegetables and some extra herbs every week. 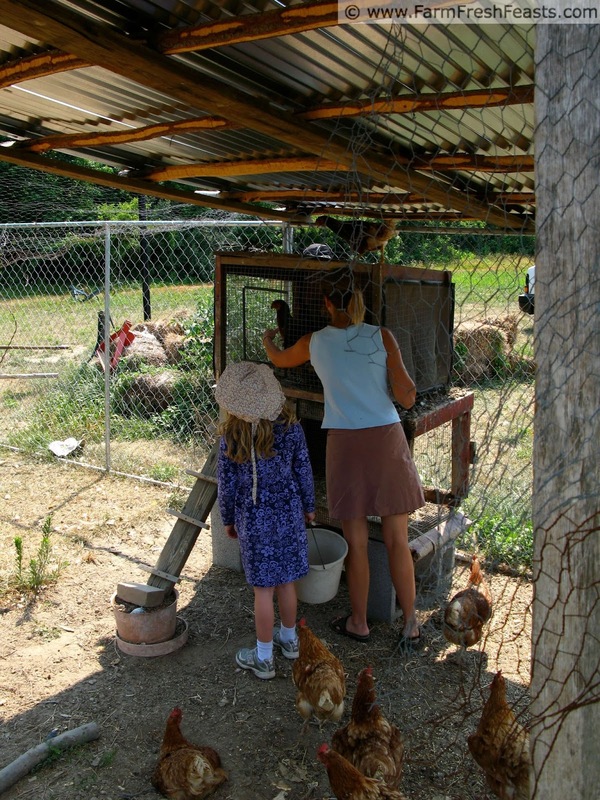 My daughter harvesting eggs with Becky Latané of Blenheim Organic Gardens. Once you've narrowed down your list of CSAs to the ones that are convenient to you, you can explore the methods used to grown the produce. The fruits and vegetables grown in your local area can be conventionally farmed, certified organically grown, or somewhere in between. I need to point out that I'm not going to debate organic vs certified organic vs sustainable growing practices vs GMO crops. Big Agriculture is not the model for success in a CSA--the diversification of crops required doesn't fit the monoculture model. It's not that I'm saying don't worry about your farm using GMO seeds or pesticides, but more that I point out if you're looking at a farmer who has chosen to offer a CSA, he or she more than likely is not using those practices to begin with. While CSA farmers are a diverse lot, all of them are bucking the established 'corn or soybeans' status quo to grow the variety of crops needed for a successful CSA. Do not overlook a local farm merely because they do not say Certified Organic. Instead, talk to the farmers about how they grow their crops. It's one of the cool aspects of knowing where your food comes from. George Mertz of Patchwork Gardens leading a farm tour. This aspect is the one in which I've seen the most change over the past dozen years. It's a wonderful time to subscribe to a CSA because you really have choices! First, of course, is pick up or delivery. Which fits best with your schedule? Next I think about timing--do you want to receive a box of produce each week or every other week? Do you want a full box, half box, or to find a friend and split a share? What about add ons--does the farm offer extra greens or a fruit share? The newest trend I see is customizing your box. The low tech way has been a "freebies" box at a pick up site. In that box may be extra items from the farm--perhaps blemished produce not good enough for the box or fresh items that won't keep. As folks pick up their shares, they can add to the freebies box anything they know they won't eat, and later arrivals can help themselves to the additional bounty. Now, though, there's a high tech way to customize. You can go online a few days prior and see which items are ripe then pick the ones you want in your box. Much less waste if you truly know your eaters won't consume the contents. You'll pay for this attribute (after all, the farmer has to invest the time and expense to grow the produce even if you don't choose it) but it can be worth it not to throw out mustard greens time and again. Or, you can come on over to my Mustard Greens Recipes Collection page and get more ideas! 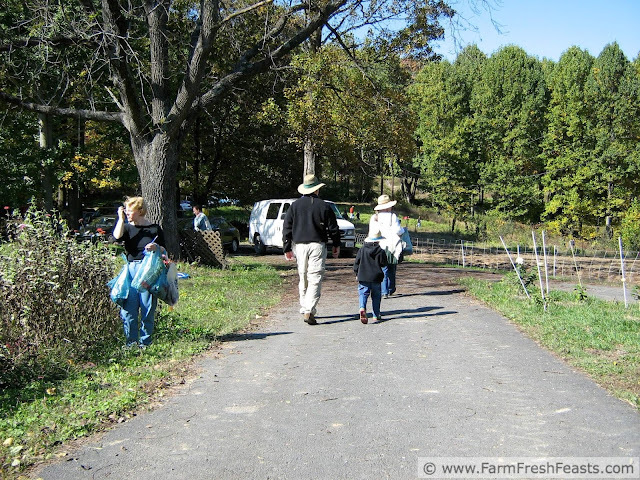 At Bull Run Mountain Farm, CSA members are invited out to glean the fields in the Fall. Next week I'll cover the WHAT question--what types of produce can you expect, and when are they ready? Here's a hint--you're not getting a whole bunch of tomatoes in May in most of the middle of the country. Sorry, but the fresh local tomato picked ripe and grown for flavor beats out a mealy pale tomato trucked for days before it reaches you. As always, if you want to know what to do with unfamiliar produce that's why I started this website and built my recipe index.